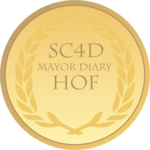 Mind Scape is a Mayor Diary started on February 27, 2007 by Robin (rooker1) at SC4D. The MD is a classic mixture of several different approaches to Sc4. Robin likes to involve his readers, using contests, trivia, quotes, and references to many other RL and community things, as well as his views on how a city would be built from his perspective. The cities in Mind Scape are very detailed and mostly consist of dirty industrial areas and low wealth residential neighbourhoods. It is very hard to find high wealth ($$$) development in the residential or commercial areas, although in Robin's busy, overcrowded downtown cores there are glimpses of $$$ CO and CS every once in a while. Mind Scape had made it to the SC4D Classics section of the MD forums and was selected by the site's staff for Of Special Interest this Month recognition three times over the course of about a year and a half. In November 2008, Mind Scape was selected by a votes at SC4D as one of the seven members of that site's MD Hall of Fame. Robin's MD is currently active. This page was last modified on 13 July 2009, at 16:15.